Whenever anyone mentions Afghanistan to me, the first picture that imerges before my mind is of a vast, sandy, desert like terrain with no habitation. I can imagine, within that picture, few details like couple of dusty roads, buildings and dwellings devastated with a never ending war and occasional Toyota trucks carrying Afghans with their AK47 automatic rifles. It is therefore rather difficult to imagine, and I am sure that very few people would believe in, that an immensely wealthy and prosperous empire with rich and fertile lands, existed within the boundaries of very same devastated land for almost a millennium. 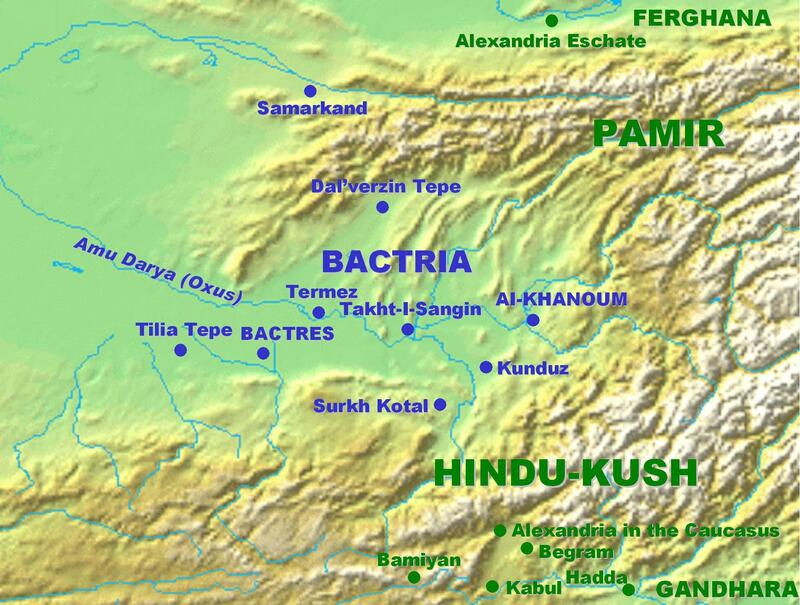 This ancient Kingdom was known as Bactria and had existed in the 'Amu Darya' river basin between Hindukush and Pamir mountain ranges. If we see the present map of Afghanistan, this 'Amu darya' river actually forms the northern boundary of the country. We can therefore say that kingdom of Bactria consisted of areas near city of Kondoz in present day Afghanistan and parts of present day Turkmenistan, Uzbekistan and Tajikistan. Since ancient times, Bactria has been a part of the Persian empire. After Alexander captured Persia in 330 BCE, it became part of Alexander's empire. In 327 BCE Alexander got married to a princess from Bactria; Roxana. Alexander died in 323 BCE and his empire was divided amongst his top 5 generals. In this period, political situation in Bactria remained very unsettled with the control of the country continuously changing hands between Greeks and the nomadic tribesmen invading Bactria from the north. In 127 BCE, Yuezi or Kushan tribesmen under leadership of king Kujula Kadphises defeated Saka tribes and took control of Bactria. We are well aware of the history that Kushans ruled over Bactria for next 100 years and moved into Gandhar and northern India only later, under king Kanishka. 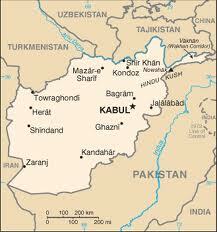 The tribes that had settled in Bactria consolidated their power well in this region. Bactrian lands are very fertile and a long association of the local people with arts and culture of the Greeks and the Persians had made the region culturally endowed. Because of these reasons, the life in Bactria under Kushan rule, became affluent and had a strong cultural bias. Viktor Sarianidi. and his team, started digging the graves on the Golden hill. They did find six skeletons under six burial mounds as expected. But what was surprising that each and every of these six burial chambers was loaded gold ornaments, coins and small idols. Obviously, all this gold was buried along with the bodies with the belief that it would make the post death journey of the dead a happy and contented one. 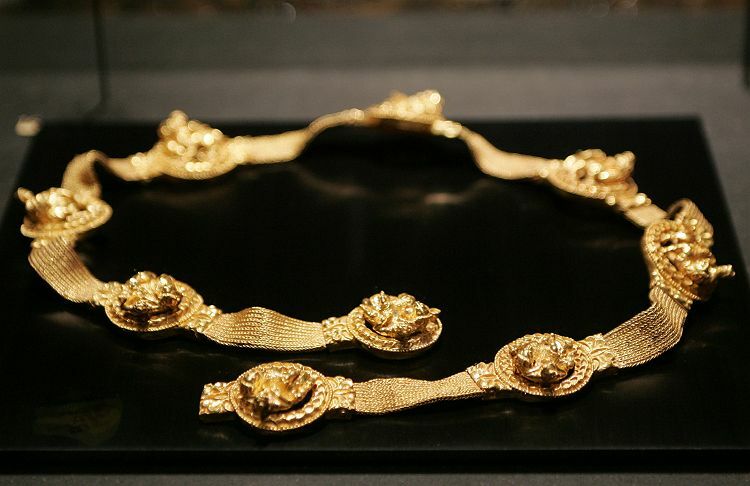 The treasure contained gold bangles and bracelets, earrings and necklaces used by the ladies and also couple of beautifully crafted gold crowns. 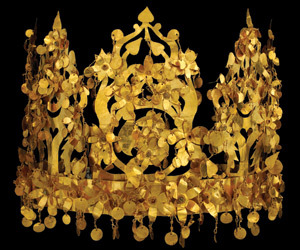 These crowns were so designed that they could be folded up for storage, indicating that the buried princess was part of a nomadic tribe, who kept moving from place to place. The crowns were so designed that it was possible to store these in a suitable pocket attached to a horse's harness after folding. Another burial place, where a warrior was buried, revealed a golden belt, gold buckles for his shoes and a golden grip for a dagger. The remnants of the clothes, worn by the buried royals were all brocaded with gold thread and with jewels. The team of archeologists in all found over 21000 thousand precious objects, below 6 burial mounds at Tillya Tepe. It was almost impossible to even estimate the total value of the find. 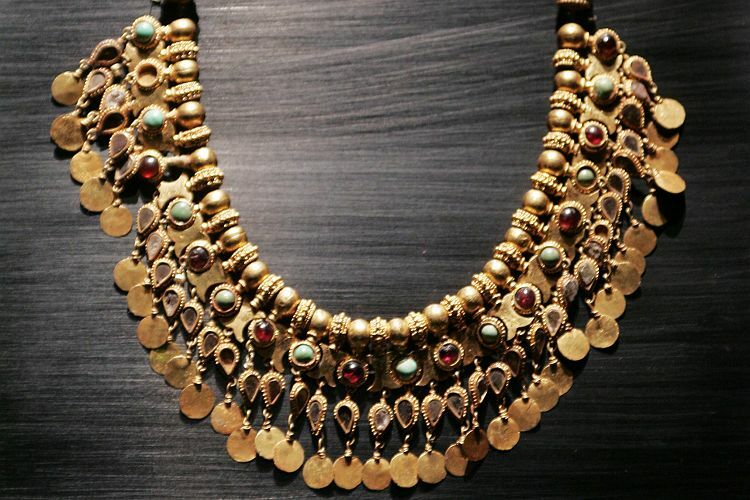 Viktor Sarianidi and his team became acutely aware of the dangers of holding this horde in their possession and hurriedly returned to Kabul and handed their precious cargo over to Kabul museum and were greatly relieved. Within one year of this find, Soviets attacked Russia and in the political turmoil, excavation of the 7th mound was forgotten. In 2003, when Afghan archeologists returned to Tillya Tepe to investigate 7th mound, they found that it was already dug up and looted. When civil war broke out in Afghanistan against the Russian forces, museum officials moved the precious horde to another museum near president's residence in 1985. The chief of Kabul museum, Umar Khan Masudi says that the horde was moved to vaults of central Afghan bank after couple of years. 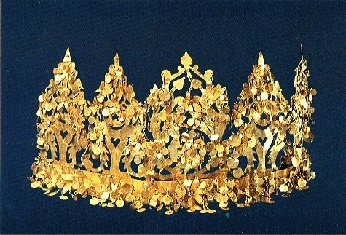 The Tillya Tope treasure was kept along with the foreign exchange and gold reserves of Afghanistan. 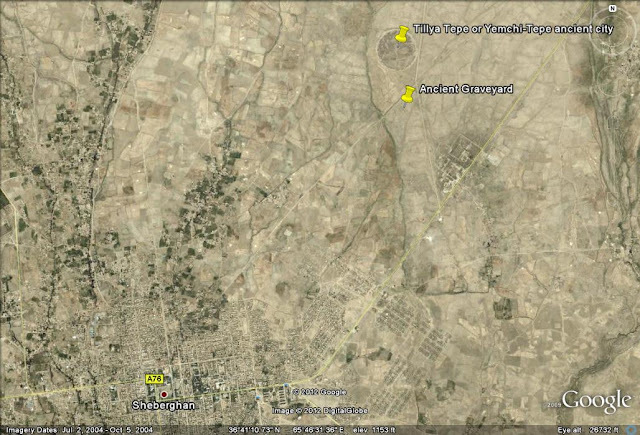 This vault was under operative control of one gentleman; Mr. Amruddin Askarzai and normally he had the keys to the vault. In 1990, when Taliban captured power in Afghanistan, they took upon themselves the task of destroying the symbols of glorious past of Afghan culture. Mr. Masudi says that almost 70% of the priceless artifacts held by Kabul museum were just stolen and were moved out to west via Pakistan route. Fortunately, since whereabouts of Bactrian horde were known to very few people, who kept quiet about it and it was stored in the bank vault, it remained safe. Later, even during days when battle raged in Kabul, against Taliban, Mr. Askarzai never shunned away from his responsibilities. He kept regularly noting down names of each and every person who entered bank's vault. 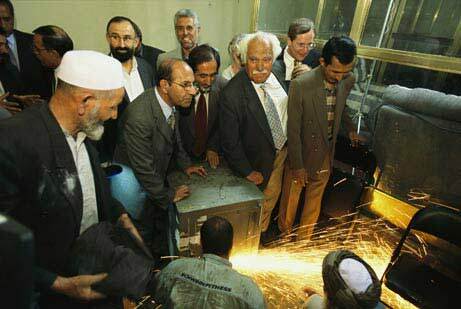 After 9-11 attack on world trade center in US, a team of Talibani ministers entered the bank and asked Mr. Askarzai to open the vault and inspected the gold, silver bricks and foreign currency notes. This vault had a small side room with a closed room. Mr. Askarzai was asked about what the room's contains. He replied that there were few old china clay pots there. After this, the Taliban team returned. Judging from the course of events, Mr. Askarzai became very much worried about the future and decided to break the vault key in the lock itself. This virtually sealed the vault. When there were clear signs that Northern alliance soldiers aided by Americans were likely to enter Kabul, few Talibani goons entered the bank and asked Mr. Askarzai to open the vault. This was not possible as the vault was sealed. The Talibani left firing few shots in the air and after stealing 4.5 Million US Dollars kept in another bank safe. After this, Mr. Askarzai was sent to jail and was also beaten. After new Government took over in Afghanistan and after almost 3 or 4 months, they realized that no suitable person was available in the central bank, who could handle foreign exchange reserves. 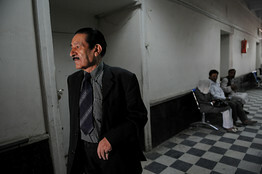 New administration, found Mr. Askarzai in a jail and was released and asked to report back for work. After resuming his job, he got the vault door repaired and new Government could again handle the foreign exchange reserves. 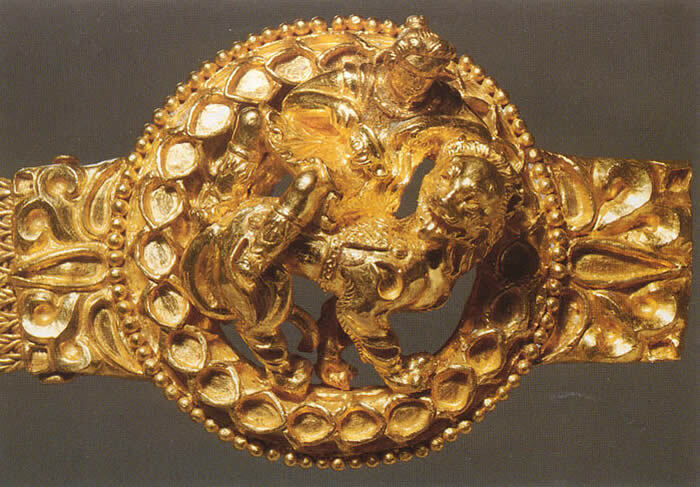 Regarding Bactrian gold, all officials kept saying that the treasure was safe and protected. 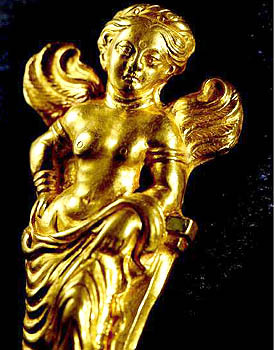 In 2004, Afghan Government notified that Bactrian treasure should be handed back to Kabul Museum. 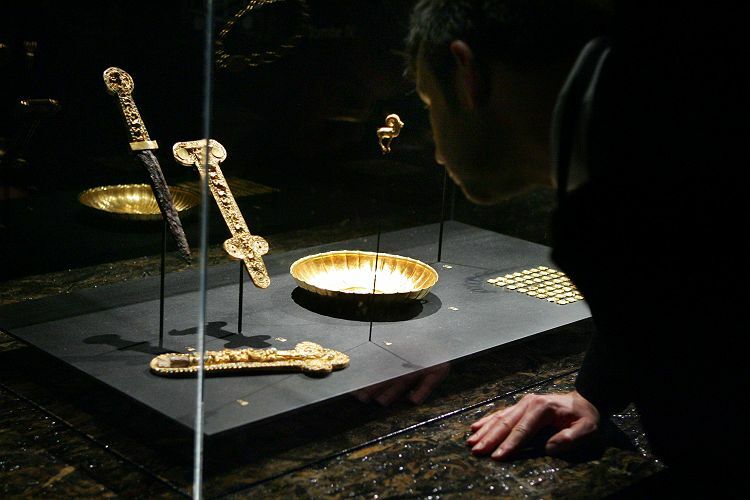 To physically transfer the treasure, a team of Afghan government, museum officials and members of the original archeologists team including Viktor Sarianidi was formed. Mr. Askarzai opened the vault in presence of this team. Then the door of the smaller side room was opened with the help of blow torches. Mr. Masudi says that after this The Bactrian treasures, which were stored in many ramshackle wooden boxes was moved out. 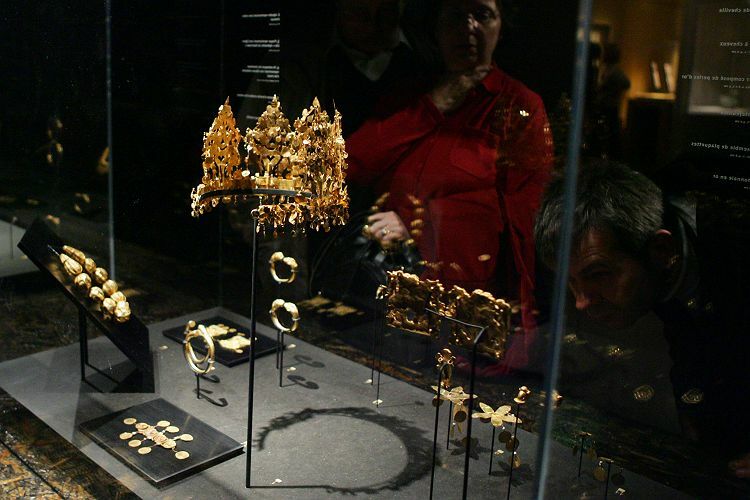 Some of the artifacts from the Bactrian horde were later exhibited in Paris. In this exhibition, Mr.Masudi of Kabul museum was given a prize of 25000 Euro's for preservation of the horde. 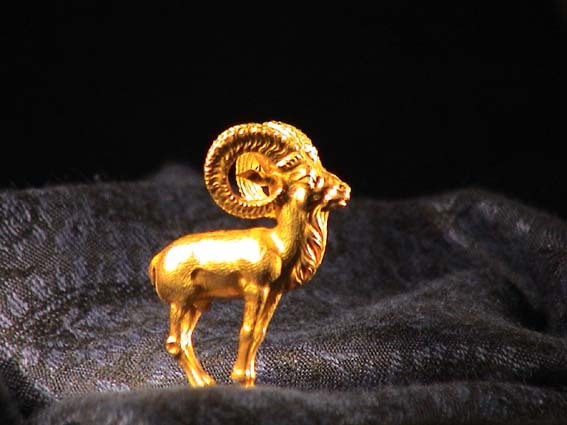 Mr. Askarzai however never came into limelight as he was always afraid that if Talibani's find out that he was principally responsible for the safe keeping of Bactrian gold from Talibani hands, they might take revenge against him. He continued to work in a bank,s corner. He however always feels certain resentment because he says that he kept the gold safe but Mr. Masud got the fame and prize. Mr. Masudi appears to be well aware of Mr. Askarzai's resentment because he has a word of praise for Mr. Askarzai, whenever he speaks to the media. Finally in 2009, the injustice done to Mr. Askarzai was rectified by the Afghan Government to certain extent. Chief of the central Bank of Afghanistan recommended his name to president for honour and he was presented with a medal and a prize and was honoured.